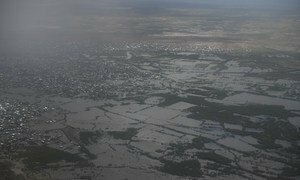 The United Nations and the Somali Government on Sunday launched a joint appeal for $80 million to provide immediate help for the people affected by recent flooding in the country’s centre and south. According to the UN Office for the Coordination of Humanitarian Affairs (OCHA), the flooding – caused by the heaviest rainfall there in more than three decades – has led to fatalities, massive displacement, and damage to infrastructure and cropland, compounding an already fragile humanitarian situation. OCHA said more than 750,000 people are estimated to have been affected by the flooding, with at least 229,000 displaced. Humanitarian partners are unable to rely on the existing $1.5 billion humanitarian response plan for Somalia for 2018, which is only 24 per cent funded. The new $80 million appeal, launched at a high-level event in Mogadishu, would provide short-term relief to the affected communities that were already vulnerable due to ongoing conflict and previous droughts. Speaking at the event, the UN Humanitarian Coordinator for Somalia, Peter de Clercq, highlighted the longer-term risks facing populations affected by floods, and the need for investment to build resilience to extreme weather events. “As climate change risks invariably increase, more resources are needed to address the root causes of fragility, chronic poverty and low human development that are affecting the bulk of the population,” he said. United Nations agencies in Somalia have stepped up their response in the wake of devastating flash floods across large parts of the country that have impacted nearly 500,000 people and displaced close to 175,000 from their homes.